The Confederated Salish and Kootenai Tribes, comprised of the Bitterroot Salish, the Pend d’Oreille and the Kootenai People, are located on the 1.317 million acre, Flathead Reservation in northwest Montana. The Tribal government has more than 1,200 employees with the largest concentration, about 200, working out of the headquarters in Pablo, Montana. 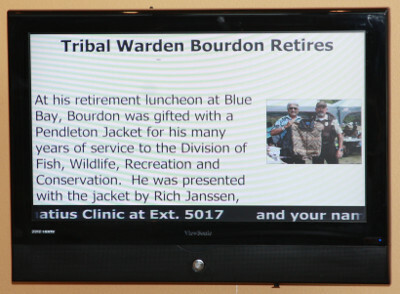 The CSKT uses several communications media to reach employees, Tribal people and the public, and recently added StrandVision Digital Signage to the mix. CSKT has a unique communications challenge as it strives to preserve the Salish, Pend d'Oreille and Kootenai Tribes' cultural heritage and communicate their histories and values to Tribal people and visitors. It also has another main audience - the CSKT employees themselves. The Tribal government previously used several communications vehicles to reach employees, including mass emails, automated text messages and phone calls, as well as the Char-Koosta News, an employee newsletter that evolved into a weekly newspaper for the full Tribal community. Under direction from the 10-member Tribal Council, Communications Director, Robert McDonald, began researching additional communications tools. This led him to StrandVision with its cloud-based Digital Signage application. Working with a limited budget, Robert used "found" equipment that the Information Technology department could spare for a digital signage system at the headquarters building lobby in Pablo. The setup includes a wall-mounted, wireless "cube" computer and a 27" monitor. The StrandVision Digital Signage features regular updates for employees, such as holiday and training schedules, awards and other Human Resources announcements. It also includes announcements for Tribal people who come to the headquarters. Notices range from Tribal government news to hunting and fishing dates and healthcare updates, as well as upcoming community events, such as home buying classes, the mission/values statement and local weather, including weather radar that is automatically provided by StrandVision. In addition to the lobby display, the StrandVision Digital Signage is also carried on the Char-Koosta News website. This free StrandVision Web broadcast feature enables the entire Tribal community to view the announcements in real time from anywhere. Explained Robert, "From the start we envisioned a hybrid approach that would reach both employees and visitors. As long as we didn't get too detailed on the employee side we could serve both audiences." Since the CSKT headquarters in Pablo is the focal point for contact with outside constituents, including elected government officials, chambers of commerce, and visitors from around the world, the signage has become part of visitors' introduction to CSKT. "It's not unusual for us to have lots of visitors. A little while ago we had a delegation from a Southeast Asia country, a guest from Germany and local elementary school students visit within two-and-a-half hours of each other," said Robert. 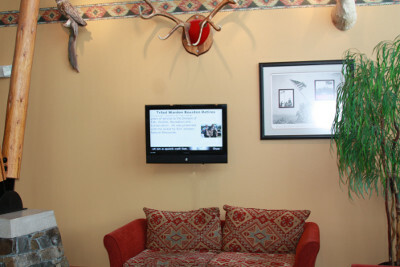 "The StrandVision Digital Signage provides an easy way for us to personally welcome each guest." Robert has used StrandVision's automated PowerPoint conversion service to convert existing PPTs to video and slides. He also posted a 30-second CSKT Public Service Announcement (PSA) that was produced for local cable channels. A recent video addition was a Montana Congressman praising an emerging tribal student. Robert anticipates additional screens and locations. Several other tribal departments across the Reservation have expressed interest in adding the StrandVision Digital Signage. The system makes it easy to have shared or individual content throughout the electronic signage network. Departments envision store window displays in town locations and adding locally-sourced digital signage content to their presentation. Robert is responding by creating a tailored "recipe" of installation instructions based on StrandVision's support materials that discusses Internet connections and equipment options. As the StrandVision Digital Signage system expands it will help CSKT share its vision. "The goal from the start was to make it an extension of us telling our story. That's what drew me to StrandVision. It's a tool to help us tell our story in small chapters to a new audience in a visually interesting way," concluded Robert.